To be enrolled in Orchestra, each student is required to pay a $60 fee. This fee will contribute to many activities that we do for our students in the orchestra program. Examples, but not limited to: bus transportation, festival/contest fees, awards, rewards, spirit t-shirt, etc. 1. The only instruments that will be provided to students for in-school use are Cello, Bass, and Harp. FISD requires a fee of $100 to use the instrument for the school year. 2. Students who play the violin and viola are required to rent from a preferred vendor. 3. Families who qualify for free and reduced lunch or have multiple children in the orchestra program at Fowler can contact Mrs. Lindsey for assistance on instrument usage. Many online sources are scams! DO NOT BUY FROM WALMART, AMAZON, COSTCO, or any online store without Mrs. Lindsey's approval. Please contact Mrs. Lindsey if you are ready to purchase an instrument. Show your orchestra spirit at home! 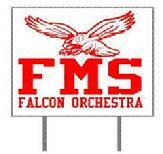 Get an orchestra yard sign to put in your front lawn or bedroom window.